Teams are on the move! Right on schedule, and it is now or never .. But there may be other pressures at work. Maybe because weather forecasts from multiple services agree. Or perhaps with the monsoons now starting in India, and moving north. Or maybe it is simply the unsaid is now being said – it is now or never – for this season. and that is the problem with Everest 2017. All Everest meteorologists agree: they have never had experienced a season in which it was so difficult forecasts for the Everest. And once they have created. If you want anything different. The weather this year is definitely the key factor. So far, there have been two very short weather window from both north and south of a few. Yes, there were approx. 20 summits of north and again so many from the south. This year first was atypical way of reaching the summit north. I have been forecasting here since 2003 and never seen a season like this with forecast model runs changing every 12 hours. Let that sink in. Michael has been watching the weather on Everest for 14 years, and this year is the most difficult. Trivia, on the majority of my 8000 meter climbs, Michael has provided the forecast. As you might know once we get that start of the monsoon we “usually” start to have the jet stream shift to the north and “general” bring some “reasonable” summit winds. So when you put all this together along with meteorologist Chris Tomer‘s notion that the next “windows” are suggested to be two days each on either side of 22 May: 18-21 or 23-25, it is time to climb. First to say the obvious for long time Everest followers, you just don’t leave base camp and go to the summit … you move steadily higher, retracing steps and camps. Generalizing as some teams go faster or slower, the chart shows both sides are similar with team skipping the lowest camps and launching their summit bid from the high camp after spending a short time there. Ideally, teams want 7 days of low winds and low precipitation, but would settle for 1 days on both sides of the summit day or 3 days of winds under 30 mph/50 kph. Bottom line is that teams are either on their way or preparing now. But before everyone gets into a mass panic, take a close look at this chart I use all the time. 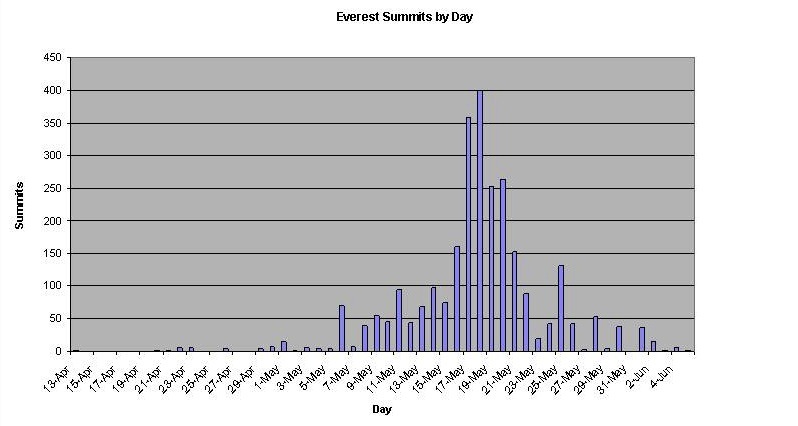 It shows we are about to enter the sweet spot of Everest summits 17-23 May. In other words, we are right on schedule!! 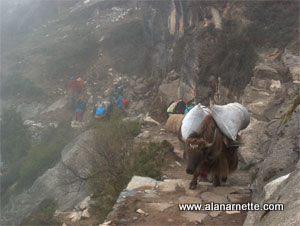 Today, our second team out on the climb from Base Camp. In order to mount 22 of May. It includes the Pole Yanush Kohansky. He goes to a new world speed record for climbing all seven peaks – 129 days. Our first team today, spent the night at the North Col camp and goes into 7800. 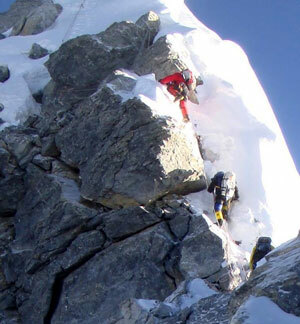 Climbing is scheduled for 19 May. Wonderful weather. Excellent condition of the route. Status of participants is excellent. I’ve eaten a giant pot noodle for breakfast and drunk two cups of tea and now it’s time to move up the mountain to begin the summit rotation. The boys are breaking the journey to ABC by sleeping at interim camp tonight (5,800m), but I’m trying to cover the whole 22km in one day – I don’t like interim camp and will have an extra rest day at ABC. We’re still targeting 23rd May for our summit bid.Thank you all for your overwhelming support. As we move into the final phase of the expedition, a reminder that I’m climbing Everest in memory of my twin uncles Micheal & Patrick, who were both taken by cancer. After looking at the weather and consulting with our Sherpas and other teams, we are heading up to ABC the day after tomorrow (18th). We will watch the summit weather carefully and make changes accordingly, but right now we are planning for a May 23 summit date. No word from Nobukazu Kuriki on his no Os attempt. I’m really pulling for him as this is his 7th year to try to summit Everest without supplemental oxygen and Sherpa support. He does use ladders and fixed lines put in by others as do most “solo” climbers these days. He has lost 9 fingers in his attempts. Also Kilian Jornet will at some point do his best Forest Gump imitation and start running from below base camp all the way to the summit on the Tibet side. I’m very interested to see his route and how long he takes. Remember, he recently ran up Cho Oyu at 26,907′ for fun, well actually it was for acclimatization. This guy is unbelievable. Pulling for him. This side now has about 10 commercial teams in waiting. Look for the leaders to coordinate with some of the large teams breaking into sub teams and the small ones navigating around the giants. We are very excited to report that on the 18th Nepal time we will start up for Camp Two on our Summit Push. It has been a long wait for a team that was ready and acclimatized early and our Sherpa team worked hard to get our camps stocked in preparation for the climb over a week ago being totally ready. We just had to play the patience game with weather. It has been a very “in and out” weather system with no real clear windows predicted with an unstable system and the jet stream flirting about, but as we have had many a meeting and good communication within our team, everyone is on the same page and supportive of the decision to wait out the early attempts and summits by other teams. You can drive yourself crazy as the expedition leader by pouring over countless weather reports that seem to be in flux day to day, and some differing in opinion of what the future will hold. So at some point, I have learned, that you must take a step back and return to being a mountaineer, draw upon the important weather forecasts yes, but also just observe and actually go climbing. We have the ability to pause or speed up once we are higher on the mountain, and some times you got to go get after it. Summit without the Hillary Step! 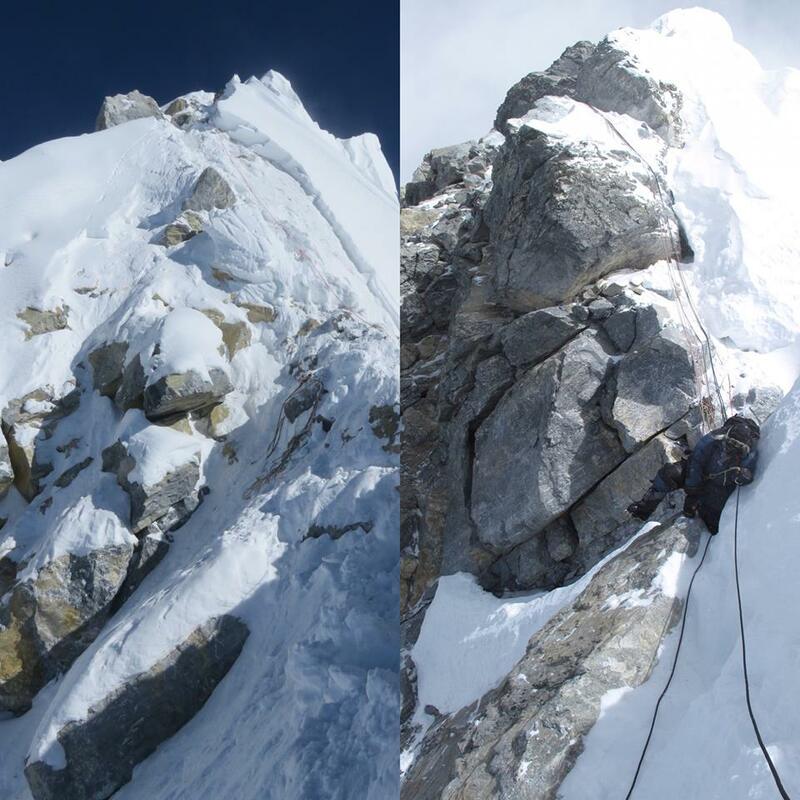 While this post has focused on the large number of climbers remaining on both sides, there are teams currently attempting Lhotse and one large Chinese team still hoping to get to the summit for the Nepal side. Tim Mosedale sneaked up with Scott Mac and Sherpas Dorje and Pertemba to summit on the 16th. Tim has an excellent report on Facebook where he describes how the rope fixing came together under leadership of the Gurkha’s with their Sherpas along with a couple of other teams. As regular readers may remember in 2016, it was reported the Hillary Step was “gone”. Speculation ranged from the rocks that defined the 50 foot high crack had collapsed in the earthquake to it was just covered in snow. Now we know. One of the traditional bottles necks on the Southeast ridge route is gone – for now – and that will speed up all climbers. If you want to explore this further a good start is with Mark Horrell‘s investigative report on his blog from last year. SUNRISE was just beginning as we reached the roof of the world & although very cold (around-30 plus wind chill) we were lost for words from the view at the beginning of a new day. During the night I often paused on rock & looked out over the moon lite summits & clouds all around. Normally stars are above you but for the first time in my life I looked out horizontally at them! What a feeling! I will be updating the location table as best I can but some teams will not reveal their plans and some will ask not to be tracked and I will honor their requests. OK, the time has finally come for all those on both sides to give their best effort to climb to the highest point on earth. There will be delays, there will be injuries and there will be joys. Climbing Mount Everest is not simple, it’s not easy and it’s an achievement to be proud of. My measure of success is whether the climber had a positive experience, regardless of the result. Thus I send my best to all for the most positive of all experiences. No Hillary Step???? Wow….this has been an iconic part of Everest for as long as I can remember!! Thanks for all the amazing updates Alan!! Well there must only be one summit of Everest. Where it’s highest! So they must meet each other! From what I gather, the summit is not that big an area. The summit is the size of a large room in a house. But yes, there is only one summit 🙂 and you meet climbers who came up from the other side on the summit all the time – quite strange actually! Yes it was my reply to Laura who asked. Must have felt weird seeing the others from the North Alan. And for the North side climbers seeing you ? ?